At last, after six years of manufacturer championship titles having been handed out also drivers got their own crown. First driver to lift this title was swede Bjorn Waldegard, having narrowly defeated his own team-mate Mikkola. Interestingly, both were employed by Ford but drove big Mercedes on both Safari and Ivory coast. A reflection of the flexible contracts of those days. Thanks to these men Ford scored impressive five wins and two second places, making quite sure of their first world title as a manufacturer. Together with inaugural drivers title for the team, 1979 was best season for Ford so far and stands out over the following years too. Two interesting manufacturers made name for themselves during 1979 season. One was Datsun who, after having long time concentrated on rough endurance events, now ventured out to more and more events and eventually outscoring even world champions of the previous season, mighty Fiat. Another was Mercedes, initially out as "private effort" but by season ending Ivory Coast cars were entered by official team. Big five-liter 450 SLC was equipped with an automatic gearbox and was slow but very durable, coming home with top four slots in Ivory coast. Not the least news in technical sense were the two firsts of the season: first win for a turbo charged car (Saab 99 Turbo in Swedish Rally) and first entry by a four-wheel driven car (Range Rover in Ivory Coast). 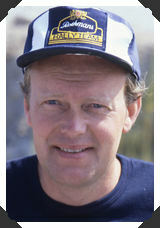 1979 FIA World Rally Champion, Bjorn Waldegard.